Be careful, though, if you have got pets of your own, they do not like the smell either. And it may sting on their paws, in their noses etc! Thanks for the tip! I use cayenne to keep cats out of my herb garden. I never thought to use it for ants. Thank you very much. I am always glad to come upon non poisonous solutions that discourage without causing suffering or death. Robert – So glad to hear you had good luck with this cayenne pepper idea. I just love to hear from people who have used my ideas and found them useful. Thanks so much for commenting. Do you sprinkle the powder right on the leaves of your plants? Linda – No you sprinkle the cayenne around the area of the plant but not on the plant. 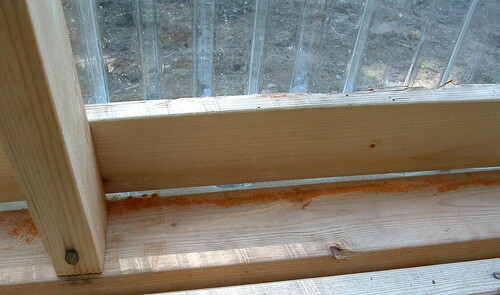 I sprinkled my cayenne around the pots and around my greenhouse to keep the rodents away. Hope this helps your problem. My husband was growing huge sunflowers for many years and then those beautiful little gold fenches found them and loved to eat the leaves. They ate and ate until the poor leaves looked like cobwebs and the plant quit growing. We heard about the Cayenne Pepper in the garden book and sprinkled the leaves. They didn’t like as much of the leaves anymore but it didn’t prevent them daily from coming to eat them. It helped and also prevented the plant from dying. would cayenne pepper also work on carpenter ants? i had a mouse go into my room two nights ago and i found about using the pepper and i tried it and i heard it running away in a flash (but i still need to find the hole) and it hasn’t come back since, now I’m thinking about the carpenter ants…oh! how about termites? @Elaine – I’m not sure if the cayenne pepper will work on ants but it might. They don’t like the smell and are possibly repelled. Good luck and let me know if you have good results with the cayenne. Pure peppermint drops work pretty good. I put in sprayer and put around all edges of carpets. It worked in my house and less mice are there. It smells good too. Do you mix the cayenne pepper with water ? Or do you you just spray it alone. @Paul – I do not mix with water. I just sprinkle the Cayenne Pepper around the openings and areas I want to repel the critters. If the Cayenne Pepper gets on your plant leaves, will it hurt the vegetable, I am trying to protect? Is there a spray available? Thank you. @Diane – I don’t think the pepper would hurt the plants but I only would put it around the area and not directly on the plants just to be safe. You might be able to make a spray using some water and put the cayenne pepper in the solution and spray it. Again I haven’t tried this and am not sure of the results. You might want to experiment on something before using this throughout your garden. Apparently cinnamon works on ants, just sprinkle around the area you want to protect.